Paul Cook pulled no punches after watching Wigan Athletic slip to a fourth defeat in a row at Middlesbrough, admitting his side are currently ‘not very good’ at both ends of the park. Latics were once again without five of their first-choice performers - Sam Morsy, Will Grigg, Gavin Massey, Michael Jacobs and Chey Dunkley - but were well-beaten on Teesside against a Boro side pushing for promotion. But the manner of both goals conceded to former Preston striker Jordan Hugill had Cook - who had warned his side to cut out ‘individual errors’ on the eve of the game - choosing his words carefully in the aftermath. “I’m very disappointed to lose the game,” he said. “We’re obviously in the midst of a really disappointing run, and to come here - against a very strong team - you know you’re going to have to defend well. “You’re always going to be put under pressure against the top teams, but the goals we’re conceding at the minute are not goals that are coming from pressure. “They’re coming from individual mistakes, stemming from what we’re trying to do, and it’s something we’ve got to eradicate. “I certainly won’t criticise my own team, that will be done in-house. “At the end of the day, you can make a million excuses, but if you offer good, strong teams like Middlesbrough the chance to gain confidence in a game, you’re going to find yourselves looking a a mountain that you can’t climb. “The individual errors must stop - they’re littering our play at the moment, game to game. Cook now has a fortnight to put things right during the international break, with Latics sitting in 16th place - four points above the drop zone. “The lads did extremely well at the start of the season,” he acknowledged. “We knew looking at the fixture list in the last months or so - West Brom, Sheffield United, Leeds, Middlesbrough - it would be unforgiving. “There are things we can offer up (as excuses), but we’re not going to. “But we’d love to be able to come off the pitch and credit the opposition for scoring great goals, and deservedly beating us. 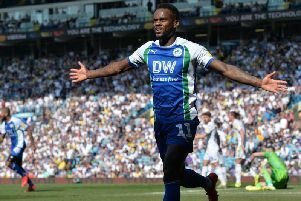 Latics had a foothold in the game before conceding the opening goal seven minutes before half-time, when an ill-fated decision by Darron Gibson to try to play the ball out from the back resulted in George friend winning possession and winning a penalty from Cedric Kipre. Number two arrived six minutes later, when Christian Walton failed to deal with a cross, allowing Hugill to volley home from 12 yards. “I wouldn’t say it’s a confidence issue,” Cook added. “What was the first goal, was it 38 minutes or something. “You’re well settled into the game by then, that’s no excuse. “We’ve got the ball on the far side, we’ve experienced players on the ball, and they’ve not made the right decision. “It’s different players making individual mistakes, but it’s a collective issue. “People have various ideas on how the game should be played, and different philosophies. “But the biggest thing in football is scoring at one end and no conceding at the other.